Estimated In Stock date is 5/3/2019. The USI Electric USI-1227L Battery-Operated Ionization Smoke and Fire Alarm responds quickly to fast-flaming fires to protect your family against deadly threats in the home. 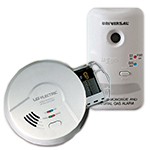 This smoke and fire alarm is operated by a 9-volt battery (included) and is suitable for installation in houses, apartments, dormitory rooms and mobile homes. Fast and easy to install with no wiring required, the USI-1227L features a flashing power indicator to ensure that the device is functioning properly and an alarm/power test button. All hardware is included to mount the round and flat plate that is designed for a quick installation. Ideal for replacement of existing smoke alarms, this battery operated alarm features a large mounting plate for coverage of drywall impressions or old paint marks. 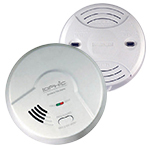 This smoke and fire alarm is UL Listed and Federal Housing Authority (FHA) approved to exceed industry standards. For maximum protection, install an alarm inside every bedroom, outside every sleeping area and on all levels of the dwelling. 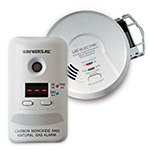 The USI Electric USI-1227L Battery-Operated Ionization Smoke and Fire Alarm comes with a 5 year limited warranty. Bought these to replace my 10 year old detectors of the same brand. They fit perfectly into the older units mounting brackets and save me that much more time on the installation...just pop in the battery and twist on the unit. So glad to find an identical unit to our old one. Thank You. just perfect and easy to get it done.